King William is a mostly rural county northeast of Richmond along Route 360. The area covers 286 square miles and has a population of 16,708. The Town of West Point is at the county’s most eastern tip. 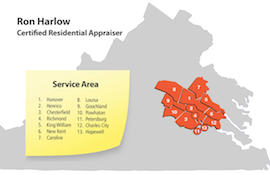 Home values in King William have been especially affected by short sales and foreclosures in recent years. Interesting trivia: the King William courthouse, built in 1725, is the oldest courthouse in continuous use in the United States.